When life handed Mark Hirsch a difficult situation, he found inspiration in the unlikeliest of places. See how one tree changed the life of this Platteville, Wis., photographer. Oct. 20, 2011 is the day that changed Mark Hirsch forever. The freelance photographer was driving back to his hotel after a four-day photo assignment in Watertown, S.D., when a concrete truck hit him, tearing the roof off of his truck and knocking him unconscious as his vehicle rolled 150 feet down the highway. Miraculously, Hirsch survived the crash with only a concussion and a few bumps and bruises. The emotional scars were a bigger problem. “After the crash, I was unable to work,” he recalls. “I had trouble sleeping. I had memory issues. I lost my drive and ambition. I was irritable and short with my family.” That’s when the Platteville, Wis., resident turned to photography, not just for income, but for solace. Hirsch began freelancing to make ends meet. A friend hired him to help restore and refurbish scissor lifts that he bought and sold at auctions, which allowed Hirsch time to pursue freelance photography. One of the freelance gigs he landed was photographing presidential candidates during their stops in Iowa, Wisconsin and Illinois. He’s done well. Among his many clients are Getty Images, The New York Times, and John Deere Corporation. Hirsch was riding high until that 2011 crash that left him searching for answers. “I sat around for three months. I was depressed. I didn’t know what was going to happen to me,” he says. In January of 2012, Hirsch purchased his first iPhone. He was encouraged by a friend to treat his iPhone like a professional camera. The first photo he took with it was of a tree, located along Airport Road, about two miles from his Platteville home. He was instantly hooked. He parked his truck and walked 400 yards during a snowstorm, trying to photograph the tree with his iPhone. “I still remember opening the frame on my laptop and seeing that beautiful image,” he says. Inspired by the process, he started making a photo a day of random scenes he discovered. He did this for a month. On March 13, he made a second photo of the tree, which he shared on his Facebook page. Ten days later, a friend sent him a note about making a photo-a-day for a year of the tree. And that’s what he did. 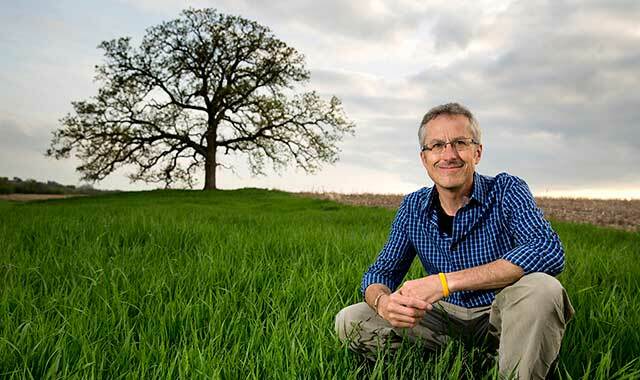 Starting on March 24, 2012, That Tree, a lone bur oak nestled in a Wisconsin cornfield, became Hirsch’s best friend. Hirsch calls it a crazy adventure that never stopped. Each day brought some new element. It might have been a particular sunrise or sunset, or a unique cloud formation. Mostly, it was the extreme weather conditions – crazy summer heat and treacherous snowstorms. Hirsch battled it all. At times it was grueling. He took a long walk around the valley and relaxed. He never worried about it again. This, he felt, is where he was meant to be. The yearlong project was completed on March 23, 2013. “That Tree” became the title of his full-color hardcover book, published by Press Syndication Group. Hirsch created a Facebook page, chronicling his adventure. Soon, thousands of people around the world were following his every move. At the urging of his daughter, Hirsch invited all his Facebook friends to join him near the tree on Day 365 for the final photo. Three hundred people showed up. Those who couldn’t come sent ornaments to decorate the tree. Since then, Hirsch has regularly exhibited his photos of That Tree in galleries. His story has been featured by CBS Sunday Morning, National Public Radio, The Huffington Post, NBC News and other media outlets. Since then, Hirsch has moved. He now lives about seven miles from That Tree. He still visits that sacred ground from time to time, posting photos on social media. Hirsch still freelances and has found his way into the publishing business, producing photography books for other photographers. He spends most of his time traveling and delivering presentations about his book to various groups. And he has plans for another book. His next project will detail other trees that he has found along his travels through the country. Hirsch’s plan is to spend a year visiting various cities, photographing and speaking to people about their favorite trees. His goal is to finish the project by fall of 2018. For Hirsch, That Tree gave him perspective. This entry was posted on Thursday, June 8th, 2017 at 11:55 am	and is filed under Features, Top Posts. You can follow any responses to this entry through the RSS 2.0 feed. Both comments and pings are currently closed.